I was so impressed by this thing that I contacted the owner and got some Hi-res photos to share. The House of Seven Rivers is a unique exotic rolling home. A true masterpiece of design, engineering and craftsmanship, this motor home is constructed of the finest materials in true yacht quality. 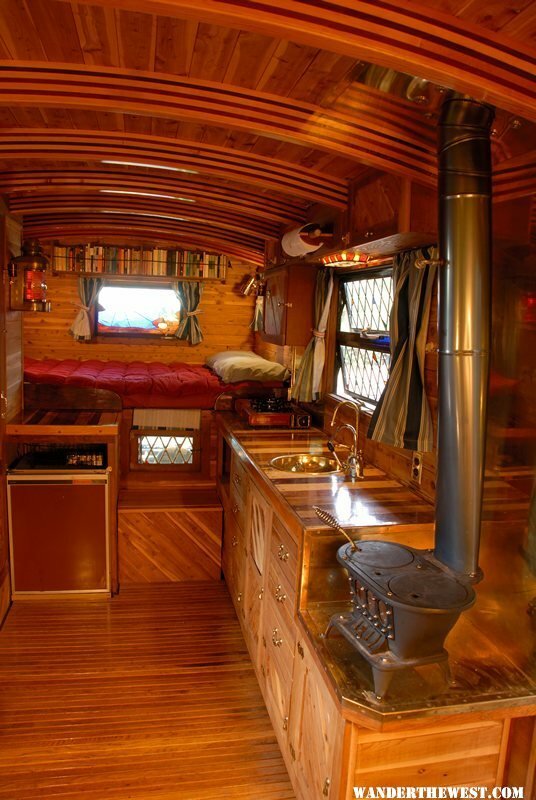 With an Incense Cedar interior, arched beam ceiling, stained glass windows in steel frames, a shower lined in solid teak wood, butcher block hardwood counter tops spaced with strips of ebony, and solid sheet copper roof, no other motor home in existence compares at any price. The first consideration in the design of this camper was to determine how small the main floor could be for extended living in comfort. Smaller is better for maneuverability—both in the forest and in town. Fourteen feet by 8 feet was the determination. This provides for a bathroom, an ample sized closet, a double bed (over the cab) and a single bed, and overall roominess. The House of Seven Rivers was designed to competely avoid having to fold implements up or down to convert for some other use—tables to beds and so forth. 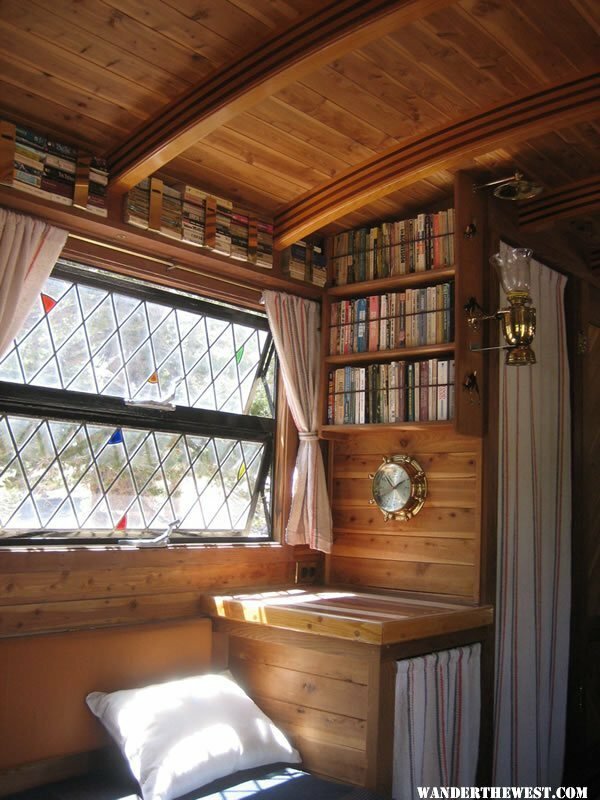 This would detract from living in what was to be a beautiful mountain cabin built with yacht quality workmanship. Seventeen floorplans were considered before finally settling on the House of Seven Rivers. Floor: 8' X 14' // Roof: 8' X 19' 7" // Overall length of truck: 25' 10" Height (on Truck): Center Roof: 10' 11" // Chimney Cap: 11' 2" // Sides: 10' 6"
The loft bed is the cab-overhang at the front of the camper. The bed’s dimensions are an ample 4’ 7” X 6’ 5”. A beautiful oak topped step provides easy access to the sleeping area which is under the barrel vaulted roof. 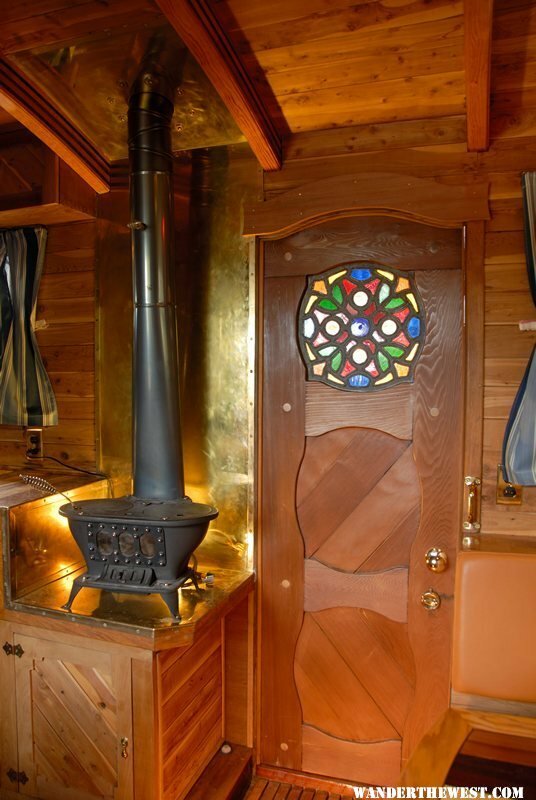 In the loft there is a stained glass reading window, and a beautiful stained glass picture of a high mountain lake. There is a bookcase on the upper part of the front wall. At the foot of the bed is a storage area, which could house a TV. A 12" wide rear overhang that serves inside as an effective long table. Like all tables in this luxurious land yacht, this one is constructed of exotic hard woods, all different, each separated by a 1/8" strip of solid African ebony, and each is screwed and plugged in the highest quality of boat joinery. A steel channel is built under the rear overhang, to transport a motorcycle or bicycle. The roof is curved and covered with copper sheeting—rare indeed today. All seams, as well as the bronze ring-shank nails, are soldered when the temperature was below freezing to prevent contraction of the copper adding strength at all temperature extremes to the soldered joints and prevent tearing. The sides of the roof have hand formed channels out of the copper, to keep rain water from running over the sides. The siding is 3/8 inch thick clear heart redwood tongue & grove, with numerous coats of the best ship’s varnish available, and fastened with solid bronze ring-shank nails. The House of Seven Rivers has 8 Windows. All are of the most elegant stained glass design, seven of these windows are in custom made louvered steel frames. The front window, as mentioned is a picture of a high mountain lake. It is protected from truck-thrown pebbles on expressways by an outer sheet of tempered glass. The 8th window (in the entry door) was the most difficult of all to make. It took 6 days. Its exterior shape and its 45 holes for the stained glass were laboriously cut and filed from sheet steel 3/32" thick. This sheet stock was electro-plated with a non-rustable metal. Then using the Tiffany copper-foil technique, the various colors of stained glass were soldered in place. The whole window was then treated with selenous acid to take the ‘newness’ off and washed. Finally, inserting the window and building the very fancy redwood panel door, with shaped cross members, took one full day. Building a window like this makes it virtually impossible to break through to get at the door lock. The roof beams are truly a blend of engineering and art. A large 9’ X 25" X 4" curved jig was cut from laminated pieces of plywood. Then one at a time, the roof rafters were bent and clamped over this jig, and glued with resorcinol, the world’s standard for superior strength, to create the elegant curve. Each beam has 7 layers of wood of alternating white pine and redwood. Finally, these rafters were planed, routed, sanded and varnished before they were installed. The walls and curved barrel vaulted ceiling are of course insulated and then planked with 3/8" tongue & groove aromatic cedar, all nailed by hand without a single hammer mark. (Grandfather’s hammer is a one of a kind!) The wall to ceiling joints are so tight that a piece of paper cannot be slipped in. The floor is built with light 1" X 2" steel channels (floor joists), welded to a 2" X 4" steel channel periphery. Five lamination 1/2" plywood is fastened to the steel channels using large solid copper rivets, and then Varathaned. The plywood is covered with a finished floor of Verathaned solid oak slats. The oak flooring lifts up in four sections for cleaning. The oak slat flooring serves the same purpose that duckboards do in a yacht. 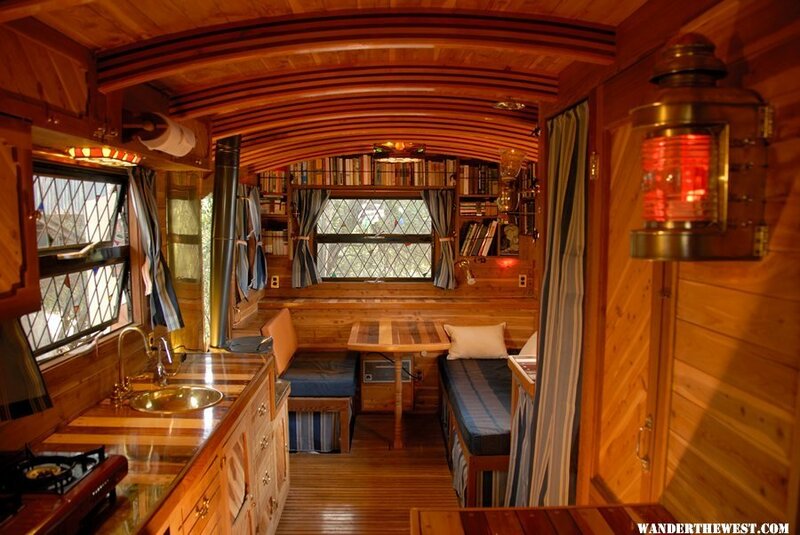 In a yacht, the slatted flooring keeps the sailor’s feet above the water in the bilge. 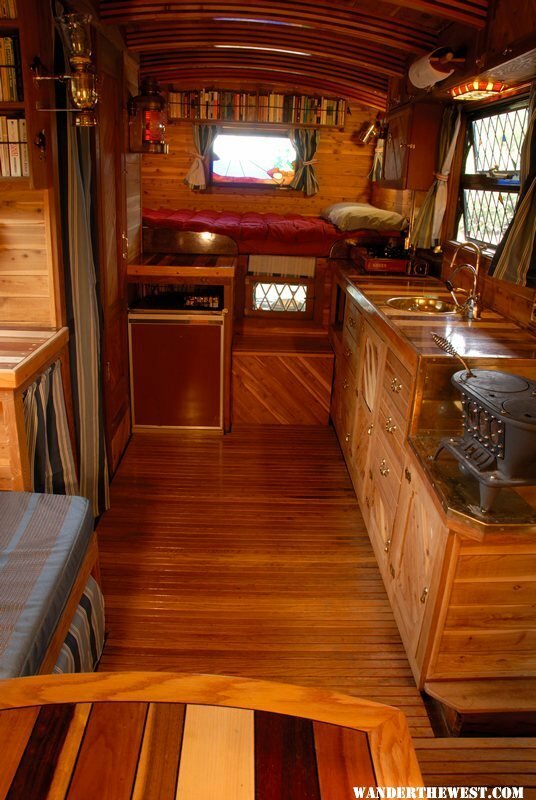 In a land yacht, the duckboard flooring allows anything that is brought in on one’s feet to settle through to the plywood underneath. This keeps the floor grit-free and clean. 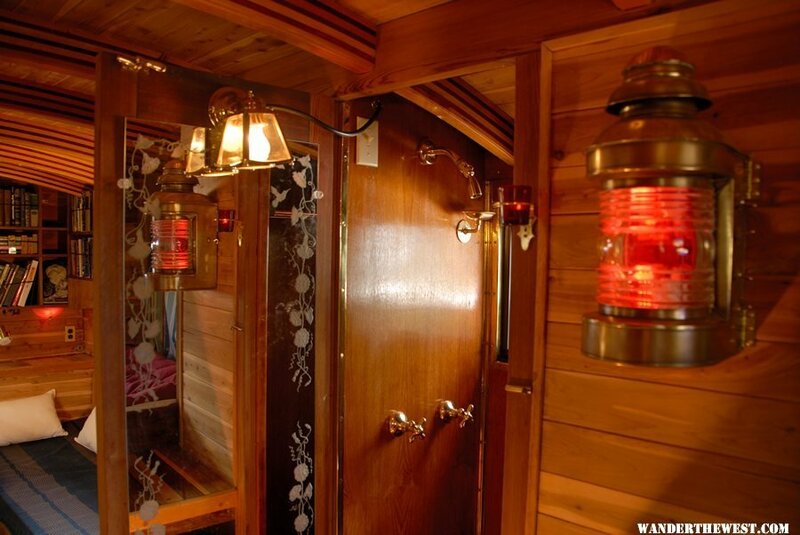 The bathroom is paneled in varnished Teak—the mariner’s favorite wood. All corners, including around the window, are trimmed in specially made polished brass, strips and angles. The counter and table tops, are an ever-present joy to behold, built from over thirty varieties of colorful and exotic hardwoods from the world. The width of each piece of hardwood varies, and each is separated by a 1/8” strip of Black African Ebony, considered to be the highest quality ebony in the world. It is used in the finest guitar frets and black piano keys. Each hardwood plank is pinned with galvanized steel pins. The kitchen sink is solid brass, hand spun in Argentina. The lower bed and seat are backed with a soft and strong Canadian tanned leather. After a great deal of research to determine which was the quietist, we selected a Thermadore electric heater. You will probably never see another rolling home or house with electric wiring this elaborate. There are 4 separate circuits. Each circuit is controlled from both the upper and lower bed. Circuit (1) is 120 volt general room illumination, and the electric heater. Circuit (2) is 120 volt mood illumination—red and amber lighting. Circuit (3) is 12 volt general room illumination. Circuit (4) is 12 volt mood illumination red and amber LED lighting. The ceiling light, is a tour de force in fixed chandeliers. This incredible fixture took eleven days to make; more time, by far, than it takes to frame an entire typical condominium. It is made of beveled tenon- jointed granadilla wood with ornate brass, and stained glass. Its beauty is beyond description. There is also stained glass lighting above the kitchen sink. An antique brass ship’s masthead light with French lighthouse type glass, provides illumination on the far end of the room. It has all four circuits of lights contained within. The room is wired for stereo. There are five distinctive handmade brass candle holders that are affixed to the walls and bookcases. They hold little red or amber glass candle holders. Each one is a unique rendition of a small gargoyle in two dimensions. The pride and joy of the mechanical systems is the Ship’s Stove. It’s a real Skippy! Made of solid cast iron, it burns either wood or coal. It was improved by Terry Thompson, the founder of the Thompson & Thelin Stove Works, by cutting in three oval windows in the front and installing mica. This allows the idyllic experience of being bathed in the warm glow of a flickering fire. This little stove is wonderful. It could probably keep the camper warm if it were minus 250 degrees outside. There is a two burner propane gas counter stove with piezoelectric ignition. The main water tank holds 67 gallons. When pressurized water is not available, for the shower and sink—as when out in the forest—there is a 12 volt water pump. There is an elegant solid brass ship’s clock made as a miniature ship’s wheel. The refrigerator is a Dometic three way: 120 volts & 12 volts & gas. The water heater is an Atwood 6.2 gallons two way 120 volts & gas. There is a portable five gallon water tank that can be taken outside and heated in the sun on warm days, or on the Skippy stove when its cold outside. Apart from being the ultimate in elegant craftsmanship and architectural design, this comparatively large camper, this rolling home: The House of Seven Rivers—and Land Yacht Extraordinaire, could also serve as the ultimate survival vehicle or emergency rolling home. To stay warm, branches can be used to fire the Skippy, and branches can be used to heat river water, or even to melt snow for a hot shower. 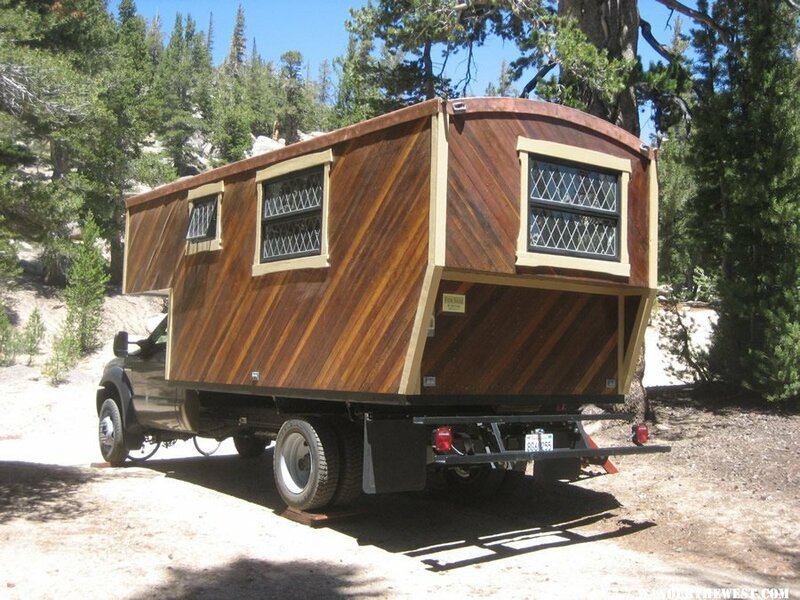 The super camper can also be used as a spare bedroom for a visitor. Included with this super camper are two miniature (non-electric) wood burning stoves for outside cooking—patent to be applied for soon. The smaller one can steam-boil vegetables for 6 minutes and then grill, meat or fish—all on a single (cut up) branch 24" long X 1" thick. In conclusion, this fine blend of art and craftsmanship, invariably brings a smile of admiration upon the face of those who enter. 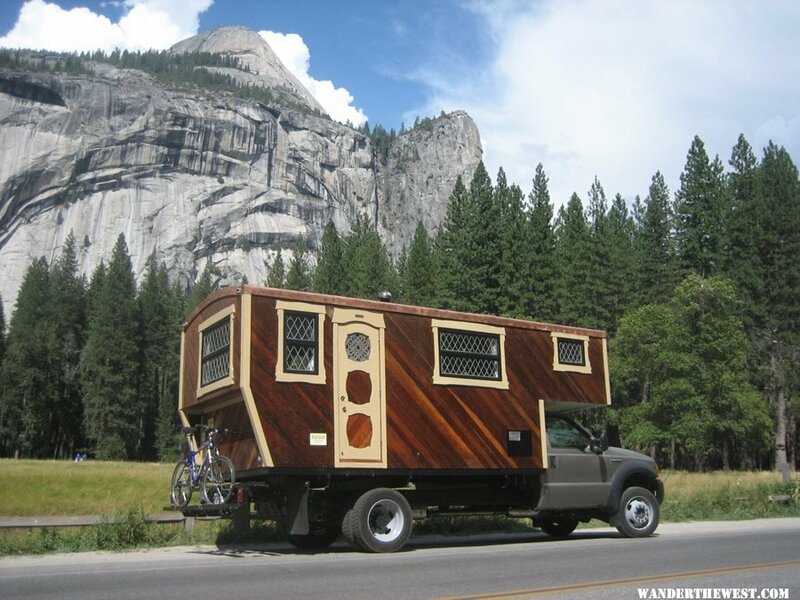 Hands down the coolest custom camper/RV I've ever seen. 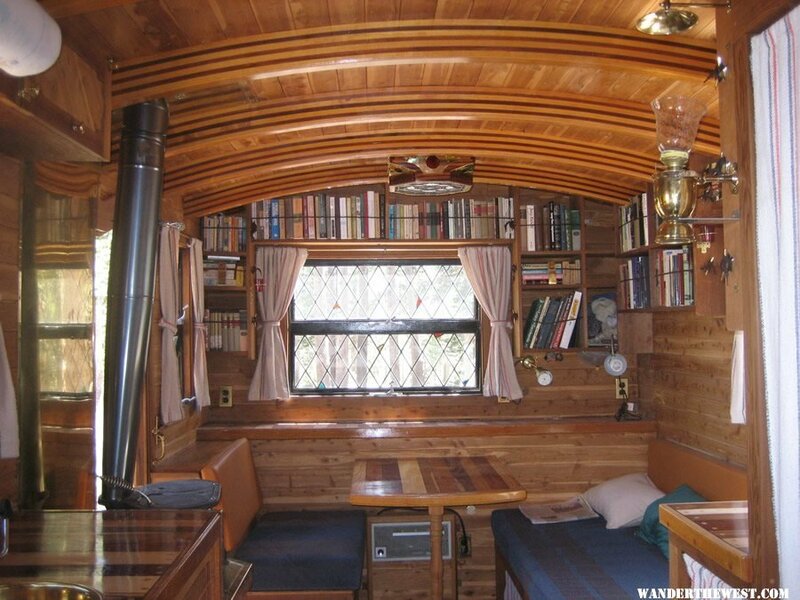 You are rather limited as to what you can do with it but I sure as hell wouldn't mind being holed up in a Big Sur raintorm with that stove cranking and a good book! That craftsmanship is very impressive. Love the stained glass. This thing is hip, fat, totaly dope. I want one. It's nicer then my house. I bet they climb up into it via a $9 folding plastic stepstool. Wonder why he's selling? Maybe he got tired of showing it off to every person that stops to look? !